Antonio Conte’s men are hoping Alex Sandro will bolster their squad. 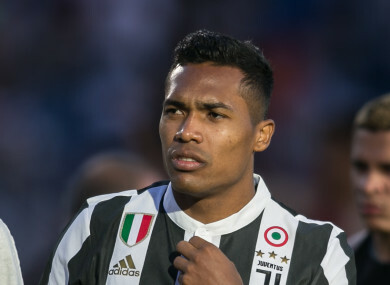 Juventus' Alex Sandro is wanted by Chelsea. Chelsea have had a £73 million (€80m) bid for Juventus’ Alex Sandro rejected. Tottenham are determined to hold onto Danny Rose, despite interest from Chelsea and Man United. Spurs are also paying no heed to interest in Dele Alli from Barcelona and Man City, even were they to offer £150m (€164m) for the England star. Irish midfielders Glenn Whelan and Conor Hourihane could face added competition for a midfield spot, with Aston Villa eyeing Arsenal’s Jack Wilshere. Leicester’s Danny Drinkwater is still wanted by Chelsea, though the Foxes are believed to be holding out for £40m (€44m). Tottenham are keen on Barcelona’s £27m(€30m)-rated midfielder Denis Suarez, with Napoli also believed to be interested in the 23-year-old. Man City and Real Madrid are both hoping to land Arsenal’s Alexis Sanchez, with the former offering £60m (€66m) for the out-of-favour Gunners star. Napoli have rejected a £55m (€60m) Barcelona bid for Italian attacker Lorenzo Insigne. Dier was born in Cheltenham, England but moved to Portugal and lived there from the age of seven. Growing up, Man United and Ireland legend Roy Keane was one of his idols. He began his career at Sporting, making 27 appearances for their senior side having previously spent time on loan at Everton. In August 2014, a 20-year-old Dier joined Tottenham in a £4m (€4.4m) deal. He has gone on to make over 100 Premier League appearances for Spurs and is an important figure for the team with his versatility allowing him to play in both defence and midfield. The fact that Man United were heavily linked with a £50m (€55m) deal for the player this summer shows what a bargain he was for Spurs in the first place. Email “Chelsea's €80m bid for Juve star rejected, Barca and City eye Alli and all today's transfer gossip ”. Feedback on “Chelsea's €80m bid for Juve star rejected, Barca and City eye Alli and all today's transfer gossip ”.